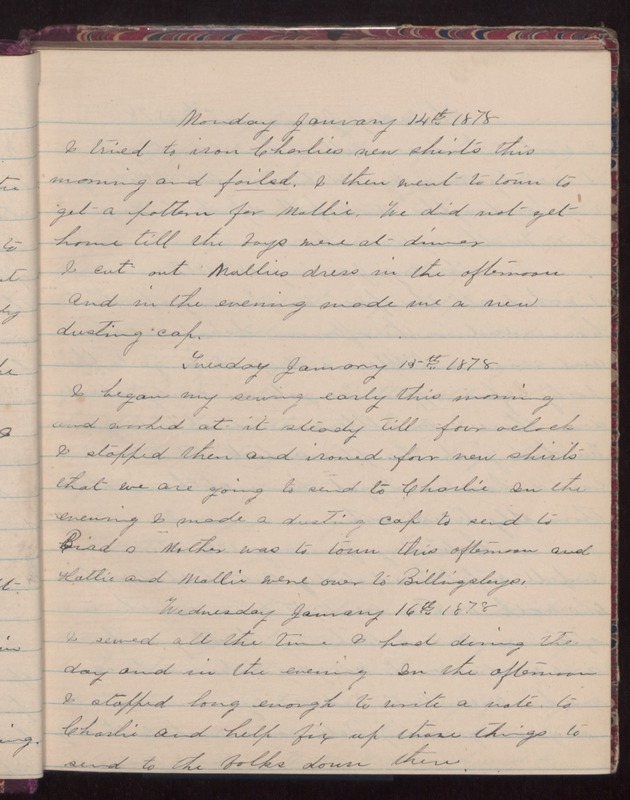 Monday January 14th 1878 I tried to iron Charlies new shirts this morning and failed [underlined]. I then went to town to get a pattern for Mollie. We did not get home till the boys were at dinner. I cut out Mollies dress in the afternoon and in the evening made me a new dusting cap. Tuesday January 15th 1878 I began my sewing early this morning and worked at it steady till four oclock. I stopped then and ironed four new shirts that we are going to send to Charlie. In the evening I made a dusting cap to send to Bird's. Mother was to town this afternoon and Hattie and Mollie were over to Billingsleys. Wednesday January 16th 1878 I sewed all the time I had during the day and in the evening. In the afternoon I stopped long enough to write a note to Charlie and help fix up those things to send to the folks down there.